Pakistani Bounty | Food and Drink | Style Weekly - Richmond, VA local news, arts, and events. 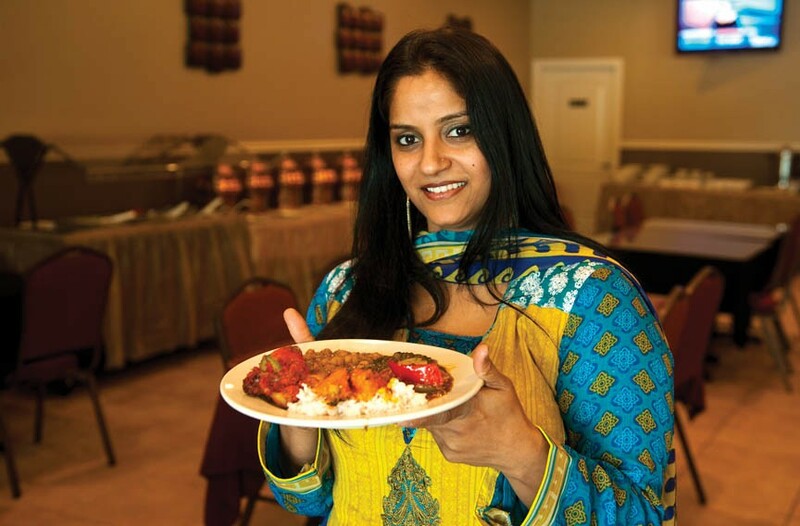 At Noorani Kabab House, owner Shagufta Sajid wears traditional Pakistani clothing; here she serves tandoori chicken, aloo palak, butter chicken, chana masala, hakka chili chicken and rice. Noorani uses only halal meats in its dishes. Indian food is incredibly diverse, as expected from a land of one billion people. Many Indian restaurants in America serve dishes made popular in the Punjab region of northern India. The Punjab people also have a significant presence in Pakistan, which helps explain why so much of the menu at Noorani Kabab House, a Pakistani restaurant, looks familiar. As hard as I tried, I couldn't pin down what differentiates Pakistani food from Indian. Various theories were proposed by friends, the restaurant's wait staff and online-forum commenters. In the end I decided to enjoy the food whether or not I could understand it. Noorani Kabab House is tucked away in a strip mall in the West End, with Indian and Indian-Pakistani restaurants as its neighbors. The lighting is dim and décor is almost nonexistent — a few mirrors hang on the wall and burgundy tablecloths adorn the tables. Noorani's menu is overwhelming. There are appetizers, chaat (savory snacks), kababs, biryani, and karahi, a Pakistani specialty cooked in a woklike pan, in addition to more familiar vegetarian and meat-based dishes such as butter chicken and mutter paneer. There also are Western-style burgers. And did I mention the separate Indo-Chinese menu? The dining experience would be vastly improved if the servers, who on most visits have more tables than they can handle, were better guides through the maze of options. Indo-Chinese food merits an explanation. An adaptation of Chinese food for Indian tastes, it's massively popular in India and with expatriots. The flavors are similar to Americanized Chinese, but spicier and less sweet. The combination of two venerable food traditions can be bizarre, as with the chili paneer dry ($5.99) — cubes of paneer cheese sautéed with chili, onions and soy sauce. Chinese food with cheese is strange but I find it strangely delicious. Similar flavors make up the fried chicken wings, known as drums of heaven ($5.99). Back on the Pakistani menu, the biryani ($8.99-$11.99), a dish in which rice, protein and spices are cooked together, is offered with many options, including paneer, egg, mutton and chicken. A good biryani offers a complex interplay of spices that are absorbed into the rice. In Noorani's version, the heat of the chilies dominates the flavor profile. And the yogurt in the accompanying raita isn't enough to cool the fire. This shortcoming could be due to my own spice tolerance, but next time I'll request a milder version. The murgh cholay ($9.99), or chicken and chickpeas, has my Indian friend exclaiming that it tastes like his mother's. Tender chicken is complimented by a mild, tomato-based sauce. Similarly excellent is the achari chicken ($10.99), made with the same spices used in Indian-style pickling. Although the pickling spices aren't as dominant as in other versions, the dish is well-executed and miles away from the cream-heavy butter chicken dishes that are Indian restaurant staples. Several desserts are worth trying, including the kheer ($3.49), a subtly flavored rice pudding with hints of cardamom and topped with pistachios. Ras malai ($3.99) consists of a mildly sweet ricottalike cheese served in a milky broth flavored with cardamom. Both desserts will cool the fire of your spicy meal. The gulab jamun ($3.99), milk solids fried and soaked in sugar syrup, will put you in a pleasant, sugar-induced coma. At lunchtime, an all-you-can-eat buffet is served ($8.99 weekdays, $9.99 weekends). The buffet rotates dishes from Noorani's expansive menu, with around 20 offered daily. It's difficult to maintain high-quality on a buffet where lots of food sits in chafing dishes all afternoon. Noorani is no exception; a few of the dishes served are outstanding, others suffer from the treatment. A few suggestions to get the most from your visit: Go early when the food is fresher and crowds are thinner, take small samples from each dish and go back for seconds on the best. The naan bread, which is served with the buffet, is fantastic and clearly made in-house. Friday and Saturday 11 a.m.-11 p.m.